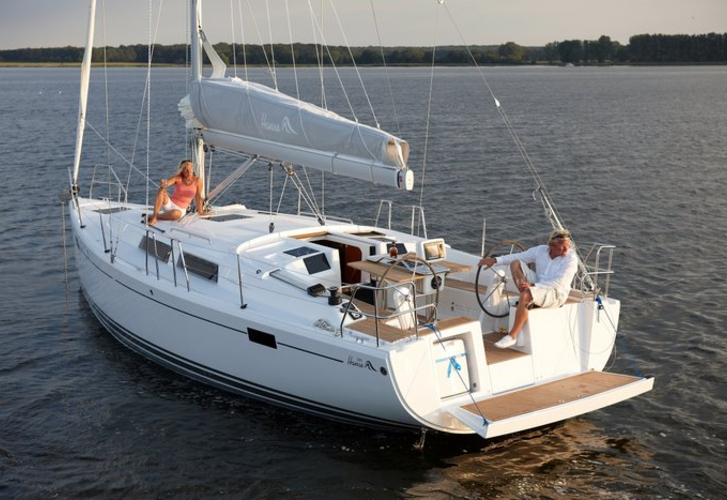 In 2014 has been produced sailboat Hanse 385 named Alkyoni. This vessel is placed in port Skiathos around Sporades in Greece. You can take in up to 6 crew members on the boat Alkyoni. Layout of sleeping places is 6. There are 3 cabins located under boat's deck. Alkyoni has 1 heads. You can find more yachts in section: Yacht charter Sporades. Diesel tank is 160.00 l l. big , water container has up to 320.00 l liters. In this vessel is applied motor 20.1 kW. With 11.40 m of LOA and 3.88 meters of beam Alkyoni offers enough space for comfortable sailing. Hanse 385 Alkyoni is equipped with: Bed linen, Gps plotter, Autopilot, Gps, Self-tacking jib , Classic mainsail, Outboard engine, Bimini top. . Deposit accounts for 2000.00 EUR. You can see different boats under this link: Yacht charter Skiathos.